Going to step away from my iMac and onto my iPad as I wait for my iPhone to ring. Possibly the biggest outside influence in my life, in all of our lives – he changed the way we look at the world, at business and at each other. He’s our generation’s Edison, someone who can be called a revolutionary thinker, a visionary and not sound like PR-speak. He will be remembered for a very, very long time. As I watched my Twitter stream, Tumblr feed and Facebook page light up with RIPs and God Blesses and Thank Yous, I made a connection between Jobs and Isaac Asimov’s fictional leader, Hari Seldon, of the Foundation Series. In the books, Seldon creates a new society based on mathematics and a little bit of misdirection, which ultimately leads to a new religion. 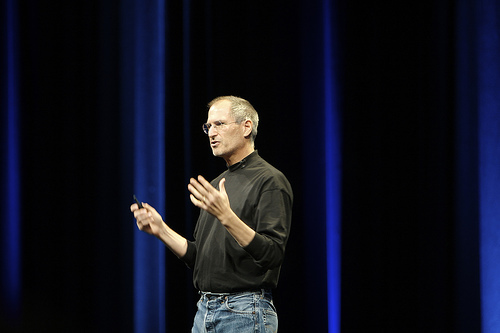 Jobs created a new society, one that empowered people through the use of the personal computer; one that changed the way we look at media, at content; and of course, one that has Apple as the center of a religion. But the more I thought about it, the stronger connection would be to a real-life human being. And besides the physical (round glasses) and mystical (Jobs’ love of the late-1960s counter-revolution), the connection from Jobs to John Lennon isn’t all that far off. I’ve been a Beatles nerd my whole life. I was 2 when Lennon was murdered, but I’ve watched video of reaction – from Walter Cronkite toPresident-elect Reagan to the interruption of Monday Night Football on that December day – and from all accounts, the world stopped. Much like it did last night when we learned the news of the death of Steve Jobs. Both were visionaries in the truest sense of the word: they saw something no one else did (yes, Lennon had McCartney and Jobs had Wozniak – geniuses in their own right). Both left us too soon. One, unanticipated, the other, we knew it was coming but it doesn’t matter. Today, as I read people’s comments and articles about Jobs, I wonder what it must have been like in 1980 to learn of, and then mourn, the death of a voice of a generation. And then think, because of Jobs, I can have that very thought.